Someone over in the XNA forums asked a question about how to make sprite explosions like those in the old Defender arcade game, where the sprite is broken into pieces and exploded everywhere. “Multiple draw calls” sounds bad, but SpriteBatch is able to batch up the draw calls so you shouldn’t notice any real effect on performance. You can download a sample XNA project to see this in action. The project also includes a SpriteExploder class that will automatically explode your sprite into multiple pieces and throw them about the screen. So we finally come to the last post in the horizon culling series. Previously we’ve discussed what horizon culling is and some reasons for using it. Then we went through the math involved in determining the angle between a line from the camera to the planet center and a line from the center to the point on the horizon. 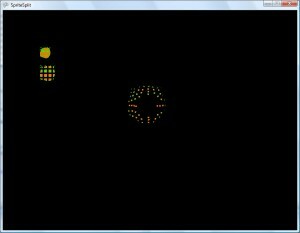 To help me visualize everything up to this point I created a standalone Windows application. Please feel free to download the app which includes a binary and full C# source code. You can change the height of the camera to see how the horizon distance and angle change. The calculations we discussed in the last post are handled in the Recalculate method. This method is called every time the slider is moved. All of the drawing is performed in the Paintbox_Paint method. The drawing code is very ugly, but since this was just intended as a simple, one time method of visualizing the math, I didn’t bother spending much time making it pretty. So, now that we have this angle, how do we use it? The basic idea is that as we draw each portion of the planet we calculate the angle between the camera to planet center line and the portion of the planet we’re drawing. If that angle is larger than the horizon angle then what we’re drawing isn’t visible to the camera so we don’t need to draw it. In reality it isn’t quite as simple as this because the part of the planet we’re drawing may have mountain where the base is beyond the horizon, but the top would still be visible since it extends above the horizon. There are multiple ways to handle this. For my purposes, at least for now, I chose the lazy man’s way and just increase the horizon angle a bit so I draw things beyond the horizon. I don’t want to go into a lot of detail here, but I need to describe in broad terms how I go about drawing a planet. Basically, the planet is divided into patches. When you’re far away from the planet the patches represent a very large part of the surface, and as you move closer the patches closest to you are split into more detailed patches. So as I draw the planet, patches that are far away have much less detail in them than patches that are close by. These patches are the lowest granularity for drawing the planet surface. In other words I can’t draw part of a patch – either the entire patch is drawn, or none of it is. So that means the patches are what we’ll be culling against the horizon, and to do that we have to use the patch position to find out what angle the patch is relative to the camera. The image below should help clarify what I’m talking about. The thick green line represents a patch that is visible to the camera. The thick red line is a patch that is beyond the horizon so it isn’t visible. When horizon culling these patches we need to determine the angle between the camera (C) and the point on the patch that is nearest the camera (P1 and P2). When determining P1 and P2 I actually only check the 4 corner points on the patch. So how do we determine the angle? 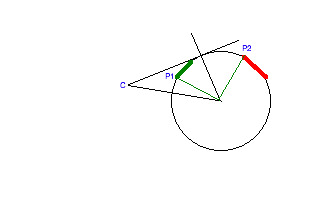 The dot product of two unit length vectors gives us the cosine of the angle between them. We can use this property to easily find the angle between the camera position and the patch position. For our purposes a point and a vector are in effect the same thing. First we have to translate each point into planet space. I’m defining planet space as a coordinate system where the center of the planet is at the coordinate 0, 0, 0. For the camera it’s camera_position – planet_position. For P1 you may have to do something different depending how your data is organized. For mine, the patch itself has a position that’s already in planet space, and each point in the patch is in patch space. So to get the closest point into planet space it’s the patch_position + closest_point_position. Again, your mileage may vary, but the ultimate goal is that both points have to be in planet space. Now, the other thing that’s required for the dot product to work is that each vector has to be unit length – i.e. it must have a length of one. To do that we have to normalize the vector, which simply involves calculating the length of the vector, then dividing each component (x, y, z) by the length. We’ll be using the built in XNA functionality for normalizing a vector. Once we have the two vectors in the same space and unit length we can do the dot product operation to give us the cosine of the angle. To get the angle we use the arccos function as we have before. So, here are the steps using C#, and the XNA vector class. Again, we get both points into planet space, normalize each, then calculate using the arccos of the dot product. 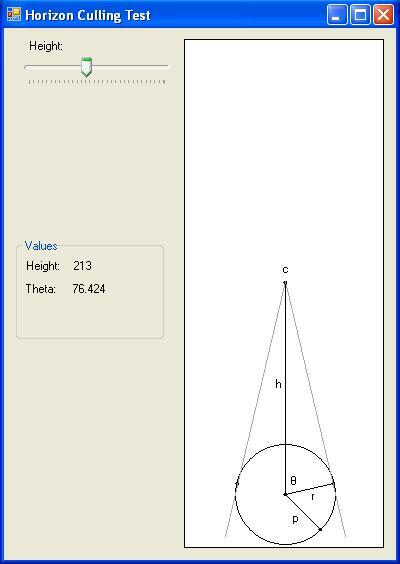 Â And since my brain still works in degrees, we use an XNA helper function to convert the angle. Now that we have that angle, we can compare it to the horizon angle. If this angle is greater than the horizon angle then we can skip drawing the patch. I mentioned earlier that you need to tweak the horizon angle a bit to account for mountains. I just add 5 degrees to the calculated angle. When very far away from the planet (over 1000 miles) I also add another 25 degrees to account for the very very large patch sizes. I arrived at these values through observation of an Earth-sized planet and they would likely need to be tweaked for different sized planets. At some point I would want to come up with an algorithm to deal with these things automatically, but they work fine now for my current needs. There are probably more formal and accurate ways of doing horizon culling to more properly deal with mountains and such, but in practice this way requires very little extra processing and the few extra (but unnecessary) patches we draw from time to time have a fairly negligible impact on performance. So, I think that does it for this series. Hopefully I’ve provided a clear enough explanation of this technique that you can use it in your own projects. If not that, then the math techniques have many applications as well. In my previous post on horizon culling we talked about what horizon culling is, the reasons one might want to do it, and went over a simple C# vector class. In this post we’ll take a look at the math we’ll need to use. In my previous post on horizon culling we talked about what horizon culling is, the reasons one might want to use it, and went over a simple C# vector class. In this post we’ll take a look at the math we’ll need to use. Referring back to one of our examples from the previous post, it seems like we’d need to calculate the two points where the planet starts curving away – i.e. where the dark blue starts. That’s the initial approach that I took while figuring this out. Â But it turns out there is a much simpler solution that uses some basic information that we have available to us. If we draw a line segment from the camera to a point tangent to the planet surface, then draw a line from the center to that point, we get a nice pretty right triangle. That makes the angle t look very interesting. That angle represents the point on the horizon where it starts to curve away from what the camera can see. When drawing the planet we can calculate a similar angle for each triangle we’re drawing. Â If that angle is less than t then the triangle is visible to the camera. If it’s greater than t then it’s over the horizon. So, let’s figure out how to calculate that angle. Dredging through some ancient high school memories we meet up with our old friend Sohcahtoa. I don’t recall the entire story I was taught about Sohcahtoa, but it had something to do with a Native-American (we called them Indians back then) who was gifted at math. It seems there are quite a few different versions of the story, but all you really need to remember is the mnemonic. 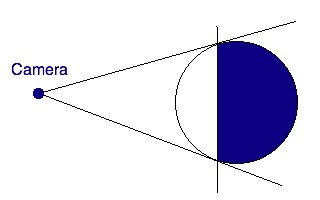 For our planet, the side opposite the angle t is the line segment that runs from C to p2. We don’t know the length of that, so it’s pretty much worthless to us. However, we do know the length of the hypotenuse – it’s the height of the camera from the center. We also know the length of the adjacent side – it’s the planet radius. The only one of our trig functions that utilizes the adjacent side and the hypotenuse is Cosine. 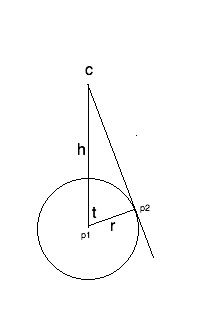 The cosine of the angle t is the length of the adjacent side divided by the length of the hypotenuse, or cos(t) = r / h.
One thing that’s interesting is that we don’t ever have to find the point p2. 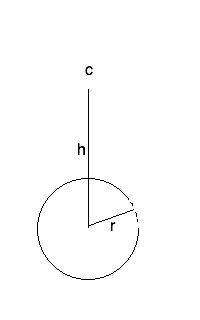 The relationship between radius and height only works for right triangles, and the radius never changes, so if we do the divide we’re always going to get the cosine as if we were working with a right triangle. You’ll be able to visualize this a bit better with the final app since you can see p2 moving as you change the height. Not terribly pretty, but it does the job. In 3D graphics, a technique that’s often used to improve performance is called culling. Culling means to reduce the population of a wild animal by selective slaughter. It also means, and this is the definition we’ll be using here, to select from a large quantity. For Horizon Culling, the large quantity we’ll be selecting from is the tens of thousands of triangles used to draw a spherical planet. And we’ll be using the horizon to determine which triangles to cull. This past year I’ve been working on a fractal planet generator using C# and XNA. The system allows transitioning from space all the way down to ground level, and features accurately sized planets, atmospheric scattering shaders, oceans, water reflections, and other typical 3D features. There’s a lot of work to be done to take it where I want to go with it someday, and parts of it don’t work well at all, but it is a good proof of concept and I made huge leaps in understanding 3D graphics techniques. I don’t currently have plans to go over the entire system here, but I’ll pick out parts of it to discuss. And for this post I’ll start with horizon culling. The image below shows why horizon culling is so useful. 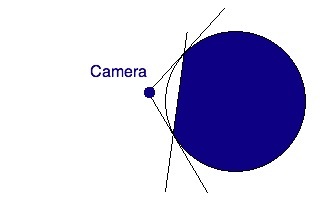 The camera is looking at the planet, and it can’t see what’s behind the horizon due to the curvature. The dark blue section shows the part of the planet that is invisible to the camera. Since the camera can’t see it, it makes no sense to draw it. The previous image shows that we can eliminate drawing more than half the planet. Now check out the following image. Note that the camera is much closer to the surface of the planet, which means that it can’t see nearly as far before the horizon interferes. This means we can eliminate drawing a huge portion of the planet. The closer you get to the surface of the planet, the less you have to draw. You can use that increased efficiency to draw more detail close to the camera where it matters. When I was coming up with the algorithm to implement this in my planet generator, I developed a test Windows application that would let me visualize everything in the simplest way I could come up with. Over the next two or three posts I want to do a kind of tutorial and walk you through creating that app. When we’re all through you should have a pretty good idea how the horizon culling works and how to apply the calculations to your app if you’re geeky enough to be creating something to display full sized planets. Most of the cool things in 3D graphics require math, and this is no exception, but let’s save the math for later. In the remainder of this post we’ll go through the preliminary step of creating a C# Vector class. Now, there’s already a Vector class in XNA that does everything we need, but I wanted the app to work without requiring XNA installation. You may want to read up on vectors if you’re not familiar. Here’s the Vector class we’ll be using. It’s a basic implementation of only the things that we require in our app and leaves out some useful things such as a cross product. It should be fairly painless to add that sort of thing if you need it. You may wonder why this is a struct instead of a class. A struct in C# looks and acts enough like a class that I feel free to call it a class, even though I suppose technically it isn’t. I’ve not really studied into it that much. One big difference though is that structs don’t cause garbage collection because they’re allocated on the stack. Garbage collection is bad in 3D graphics applications. Another way to look at this is that structs act like much like a value (e.g. an int) rather than a reference (e.g. a class, which is in effect a pointer). I think it’s time to bring this post to a close. In my next couple of posts I’ll go over the details of the culling algorithm and the rest of the app. When we’re all done I’ll post the entire app.